Click to listen to episode (2:24). From the Cumberland Gap to the Atlantic Ocean, this is Virginia Water Radio for the week of June 24, 2013. If you guessed an alligator, you’re right! The American Alligator is found in all kinds of freshwater habitats—from swamps to old rice fields to large rivers— in the Atlantic and Gulf coast states from the Carolinas to Texas, as well as in parts of Arkansas and Oklahoma. Alligators’ known native range did not include Virginia, but that range did include North Carolina’s part of the Dismal Swamp, just below the Virginia border. While some people believe wild alligators may reach the Commonwealth from North Carolina, or that they may eventually increase their range in a warmer climate, the current occasional Virginia sightings or captures are generally presumed to result from accidental or intentional release of animals kept as pets. It’s illegal to import, possess, or sell alligators in Virginia without a special state permit. They’re fascinating reptiles, best viewed from a distance in their native habitats. Thanks to the U.S. Fish and Wildlife Service for permission to use this week’s sound. 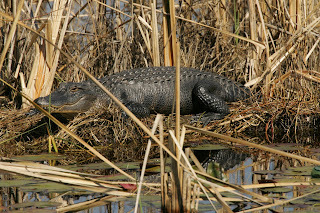 Alligator at St. Marks National Wildlife Refuge in Florida, February 2009. Photo by Steve Hillebrand, made available for public use by the U.S. Fish and Wildlife Service's National Digital Library, online at http://digitalmedia.fws.gov, accessed 6-24-13. Acknowledgments: Alligator sounds were recorded in Georgia in 2000 and were taken from the U.S. Fish and Wildlife Service’s “National Digital Library” (public domain sounds) at http://digitalmedia.fws.gov/cdm/singleitem/collection/audio/id/21/rec/1. Alligator sounds and information were included previously in Virginia Water Radio Episode 42 (week of 11-15-10), now archived. *Virginia Herpetological Society, online at www.virginiaherpetologicalsociety.com. *Slate.com, “Alligators in Your Backyard,” by Jackson Landers, 2/19/13. *“Alligators relocate in area waters,” Washington Times, 5/24/05.